and chocolaty topping blended in creamy vanilla soft serve"
Problem is (as is always the case), my local DQ is ill-prepared for today. I try hard not to pick on seasonal help, and to be honest it's technically not their fault, but how in the bloody blue blazes do you run a DQ and not prepare your people for the first of the month? It's called the blizzard of the MONTH, not the blizzard of the last few weeks of the month. It's not like this one even requires special ingredients, you just need to make it right. This particular DQ has been doing this for years, and I know of at least one old DQ that has similar trouble. There is a new DQ Grill & Chill in Worcester County and I swear they probably change their signs at 12:00:01 AM on the first day of the month because they are ALWAYS on the ball. However, these random old DQs put the PAIN in PArtIcipatiNg location. What's the point of having 4 million people in your blizzard fan club if you aren't ready for them? Sorry, enough frustration. I will admit that when I checked the internet this morning that I was pretty psyched to see this new blizzard on facebook. It didn't exactly take a lot to convince myself to get this new blizzard for lunch (though deep down I suspected I would fail, maybe I need to think more positive). Despite the fact this blizzard wasn't the official version, it was a reminder that I really don't like M&Ms in my blizzard anymore. Oh, the brownies were excellent and fairly plentiful, but the crunch of the M&Ms was driving me nuts. They are just too solid and wind up frustrating me. Maybe a chocolate swirl would have helped distract me, but I doubt it. 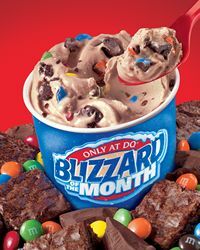 The new for 2012 M&M brownie blizzard sounds great on paper, but I'll take a turtle brownie blizzard instead any day. This one just seems really boring to me. I mean, M&M's and Brownies? Pretty basic, although it is a fat kid's delight. Still, not "exciting" enough that I'll be rushing out to try it and your somewhat tepid review pretty much affirms that for me. Sorry to read that but as THE GREATEST BLIZZARD FAN myself I noticed that your m&m brownie blizzard actually didn't have the chocolate sauce ( I noticed by the picture you showed ). 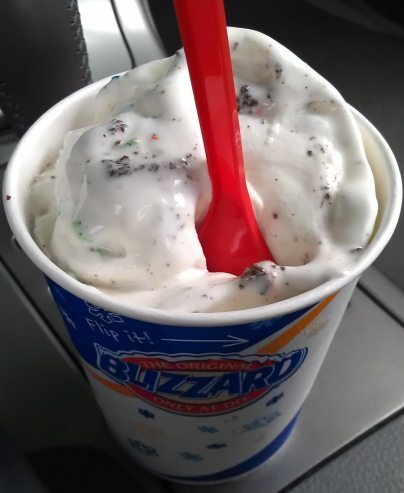 I love all the blizzard treats but I always love to read other people's reviews as for the whole not prepared thing I suggest not to go to the drive thru and tell your local DQ employees what's in it and see them make it. ummm, you did read the whole article right? I specifically said several times it wasn't the right blizzard. That was the entire point of my tirade. Also, keep it mind that in the past, DQ takes forever to update their website, so I often dont know what's in the blizzard of the month, or even if I do, this particular DQ is often missing one of the ingredients. I would be a much bigger fan if there was some magic way to make the M&Ms softer. For some reason when I saw you post about the new blizzard I thought it was made with brownies that had m&m's in them like those m&m's cookies. Now this is no where as awesome as I thought it would be. In my experience, when something is called "chocolatey" (as opposed to "chocolate"), that means it's not real chocolate. So you might have been better off without the topping! But I agree with you aboug M&Ms, they just don't pair right with ice cream. Were the M&M's grounded up or did they retain their full shape and size after being mixed into the ice cream? they get chunked up, but the chunks are fairly large, so they still add a lot of resistance shall we say. It's still probably better than a McDonald's M&M's Mcflurry because the M&M's in a Mcflurry are mini M&M's and get mixed in without being chunked up, retaining their full size and shape, and thus not affecting the overall flavor much, if at all. Dubba just had the new Blizzard of the Month and it's pretty good. However they must have put their new hires on tonight because she said it was $3.30, I gave her $5.35 and she gave me $2 back - I want my nickel! haha So when she handed me the blizzard and it was below the cup line I wasn't surprised.I'm used to it over flowing so much it leaks out of the lid. I haven't had M&M's in ice cream before and I like the texture however she added waaaay too many so there was zero blank space for the ice cream to shine and for you to distinguish the brownies. The fudge swirl is very good as well and it's a shame you didn't experience that part. I say give it another shot and have it made the right way!